We just received news that Allard distributor Alan 'Al' Moss just passed away at the age of 80. 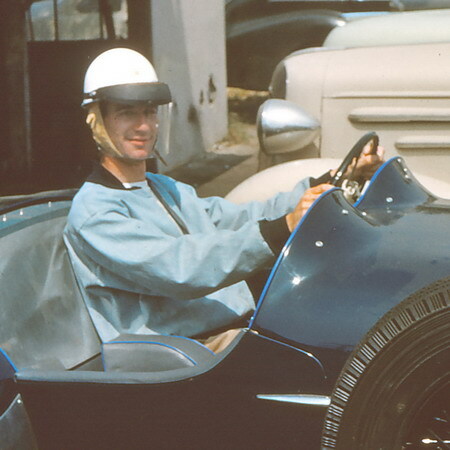 Al was a legend in the West Coast sports car scene...ever heard of Moss Motors? It's tough to even start describing Al's amazing life. Not only was he an entrepenuer, but he was an absolute character and jokester. I am honored to have had the brief chance to get to know the man...enjoying several long phone calls reminicing about Allard's and the people that raced them. We'll come back soon with a more fitting tribute to this legend. The photo above is of Al Moss sitting in Hastings Harcout's J2X in front of Ak Miller's shop. PS: The Allard Register was honored when Al passed on all of his Allard correspondence to us. To read some of it, just type 'Moss' into our search bar.